“This week’s really busy”. “Sorry I’m slammed at the moment”. “We’re manic”.”It’s crazy”. I get about 100 emails every week with something that let’s me know that me that the sender is really very busy. 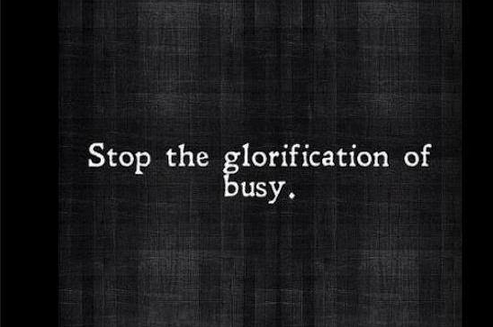 We’ve created a culture where it’s necessary, cool even, to exclaim how busy we are. The amount we have to do is proffered as a currency of importance. The busier we are, the more important we must be… The more we are needed because everyone just wants a piece of our delectable selves. I try to avoid these descriptions. My weeks are sometimes quite full, but I hope never manic, busy or crazy. I try to book in time, if necessary, to enable space and spontaneity. Whenever I get too busy, all the work I do suffers. My ‘busiest’ weeks are rarely my most productive. I try to work like it’s the weekend if I can. If Barak Obama asked to meet you this afternoon, you’d probably find time – as much as he wanted. If Warren Buffet wanted to call round, you’d clear your diary. If Natalie Portman decided she wanted to do an impromptu reading of The Love Song of J. Alfred Prufrock in my living room, booked events would magically vanish from my schedule. Hell, she could have all week. So ‘busy’, ‘manic’ and all the other ways we describe ourselves are basically a way of telling someone they’re unimportant – it’s a passive aggressive way of telling someone to get lost. The most successful people have full lives, but Warren Buffett isn’t ‘manic’, he has time to ‘read all day‘. I’m fairly confident that Bill Gates, Steve Jobs are/were rarely hectic. I don’t want to hire manic, busy or crazy people. Whenever someone tells me they’re overly busy then my instant reaction is to wonder whether they’re much fun to be around, or whether I want to work with them. Sounds like a stressful, unbalanced culture they’re emanating. It suggests the work they’ll be doing won’t be deep, or carefully thought through.